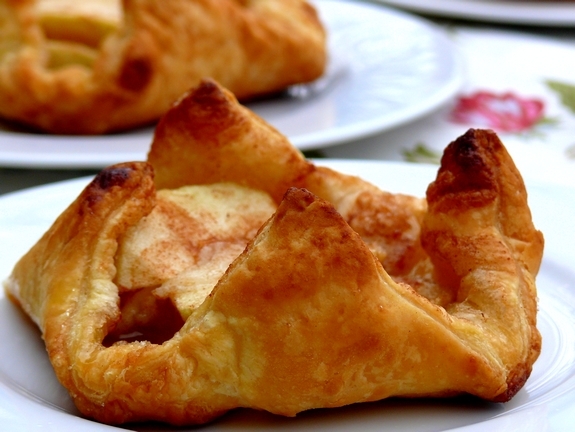 Simple to put together and tasty to enjoy, these Individual Puff Pastry Apple Tarts with Almond and Cinnamon are an entertainer’s dream dessert. Top them off with a scoop of vanilla ice cream or whipped cream and let the swooning begin. See this recipe made on video here. Wow, it has been a busy week! Spring has sort of sprung in Oregon…there have been a handful of sunny days. The tasting room has been a madhouse and we’ve had so many long-time blog readers visit. It’s always SO fun when you all come out and say hi…it validates what I do here. At least in my mind it does. I’ve also hired a new crew in the tasting room, make sure you drop by and say hi to Jeff, Joni and Marissa…they will be helping me keep my sanity as we head into the busy wine tasting season. We continue to do wine pairings with small little nibbles and bites, it’s really a fun way to spend your afternoon. Now these tarts, they are so easy to make, my kids could do it. But the secret ingredient here is the almond paste (which I did could eat with a spoon by the way and you’ll find it in the baking aisle). These are the perfect after dinner treat and will impress any company you might be having over. These tarts open up like little blossoms. They are also perfect topped with whipped cream or vanilla ice cream. We did try both, but they were too warm to put on before taking a picture, as the whipped cream and ice cream would have melted. And of course everyone was begging for their dessert…well, you get it. It’s the life of a food blogger, trying to get pictures, while your family stands in the background and watches their warm food go cold. Sorry family. Anyway, give these a try…you will love…. See how simple they are to put together. They are really out of this world! Position a rack in the center of the oven and preheat to 425 degrees F.
Line a baking sheet with parchment. Combine the sugar and cinnamon in a small bowl. Unroll or unfold the puff pastry on a cutting board. Pinch any creases together and then smooth them out with your fingertips. Cut the pastry sheet into four equal squares with a pizza cutter or a sharp knife. Transfer the squares to the lined baking sheet. Roll 1-1/2 teaspoons of almond paste into a small ball and flatten it slightly with the palm of your hand, placing it in the center of one puff pastry square. Drop 1 teaspoon of sour cream on top. Sprinkle 1/2 Tablespoon of the cinnamon sugar over the sour cream. 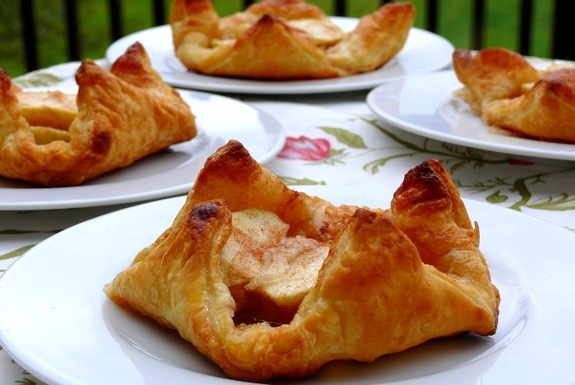 Arrange four apple wedges in the center of the puff pastry, two leaning away from the center one way and two leaning the other way (see picture above). Sprinkle with another 1/2 Tablespoon of the cinnamon sugar. Repeat with the three remaining puff pastry squares and filling ingredients. 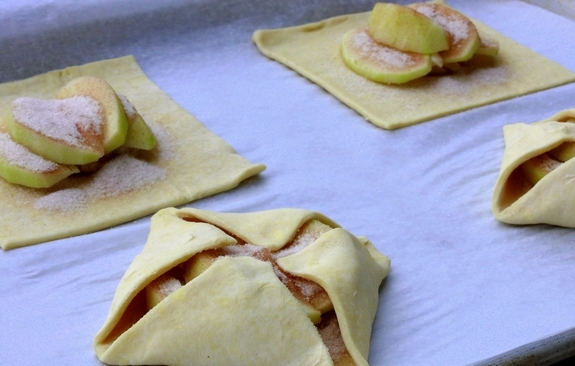 Fold the corners of the puff pastry over the apples until the tips are just touching but not overlapping and press the dough against the apples. By the dough not touching, this is what will give them their "blossoming" look. Bake until puffed and golden brown on the edges, 22 to 27 minutes. Let cool slightly. Any juices that leak onto the baking sheet will harden to a candy-like consistency, so break off and discard these bits before serving. What a fabulous tart! Yum! We enjoyed visit the tasting room very much this past weekend. The wine was delicious! (and so were the nibbles) Thanks! It was great meeting you guys!! your photos are always so gorgeous, these look delicious! These look delicious. Do you think they could be frozen and reheated? Hmmm, I think it would lose those flaky puff pastry layers of goodness. I’ve never cooked with almond paste, but can’t wait to try it – these look so tasty! I made these last night and what a hit!! I made these yesterday.. mmm.. wonderful.. but a hint.. do NOT leave your dough out too long to thaw.. i had a mess getting it apart.. also my husband said he would have liked to have the apples peeled??? I Love all your recipes.. thanks. I made this tonight, and it was great! I changed the recipe by making two big tarts using two sheets of puff pastry and 3 apples, and topping them with sliced almonds. Made these tonight but used strawberries I got at Farmer’s Market this morning instead of apples. SO good! My husband ate two of them! I bet these would be good with any fruit in them! Oh nom nom nom nom nom….just finished eating this – VERY delicious! I peeled my apples per one of the comments and second the comment about making sure you don’t let them thaw too long or they will be too sticky. I like that they were 1.) Very yummy 2.) Very Easy to make and 3.) Look fancy. ok… this is the third time this week I’m making these tarts… and this time with pears (and a sugar mixture of ginger, nutmeg and cinnamon) plus little marzipan balls that I’ve squished flat! New fave dessert… and so stunningly simple to make… wow! thank you!! hope you don’t mind, but it’s going into my “family recipes” folder!! So glad you are enjoying them, thanks for the feedback! Just discovered your website/blog and tried these today (1-2-15). These are the easiest to make, great tasting dessert ever! But….I think you already know that. You have a whole lot of great ideas. Can’t wait to try the Bourbon glazed Corned Beef plus the raspberry coffee cake. Can you omit the sour cream?